The global Steering columns market is estimated to surpass $19 billion by 2024 growing at more than 10% during the forecast period 2018 to 2024. Approximately 120 Million steering column were sold in 2017, China appeared to be the market leader with 31 Million steering columns. Passenger cars constituted for 65% of market share and were the huge demand generators for the steering columns. Electric power steering systems is gaining traction because the technology provides better fuel economy as compared to the hydraulic power steering system. Steering columns are now being connected to on-board network, enabling the vehicles to provide assistance while driving. Functions such as lane-keeping, hands-on-wheel detection and traffic jam assist can be enabled using the on-board network. This would further assist the companies to achieve level 4 automation and provide better safety in level 3 automation. Manually adjusted steering columns will allow the driver to adjust the height and depth of the steering according to his own comfort. Electric powered steering system play a major role in the electrification of drive train. The increasing demand for electric vehicles is further driving the market for automotive steering columns system market. The demand for electronic based steering systems which are integrated in to electric vehicles has increased exponentially. In-addition the electronically controlled steering being the basic requirement for implementing automated driving system, and with the increasing demand for electric vehicles the automotive steering systems market would experience positive growth. Majority of the companies manufacturing automotive steering systems are investing in R&D aiming to link steering system with on-board computers, increase safety of the vehicle using collapsible steering columns and develop electronically controlled steering for electrification of drivetrain. To improve the safety of the vehicles, companies have started developing impact absorbing steering columns. Companies such as NSK are involved in developing collapsible columns which can absorb load during a collision. The company is also developing pivot tilt steering column and Telescopic Steering Column for Trucks which adds rigidity for heavy vehicles. Robert Bosch’s steering column system technology, Servo electric enables driver assistance functions and helps to reduce the vehicle’s fuel consumption. The production of this technology marks the first time that Bosch is producing this innovative steering system in Mexico. Recirculating Ball & Nut Steering System find huge replacement demand from old trucks and SUVs. Although the new automobiles are equipped with rack and pinion steering system, very few companies such as Chrysler and General Motors incorporate the Recirculating Ball Steering System technology in a few models. The demand for chrome steering columns is also gaining prominence in the classic vehicle models. The Electric power steering (EPS) has becoming much more common given that it’s more efficient and low cost. It eliminates the use of many components such as pump, hoses, fluid, drive belt, and pulley. This also leads to a reduction is size of the steering column when compared to the hydraulic steering systems. Who are the Major Players in Steering Column market? Steering columns are being developed to achieve advanced functionalities which cannot be attained by conventional means. Collapsible steering columns are being employed to reduce the impact on the passenger vehicle in case of accident. 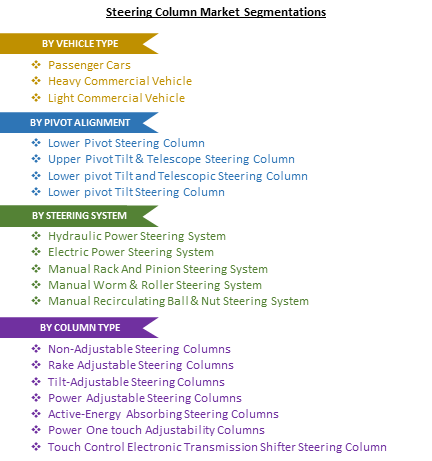 This report incorporates an in-depth assessment of Steering columns market by type of vehicle, by pivot Alignment, by steering Columns, and geography.